Yes guys its true now you can Hack/reset any Nokia Mobile Password with few clicks as this time Tricksage.blog brings for you all.. 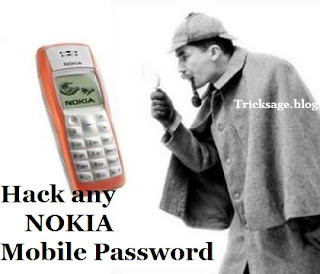 Sometime it happens that we actually forgot our own password or some time we intensionally wants to crack password or simply hack that password, So, we can say that some time Security Code are useful but some time not when we owner of phone forgot password,as this trick is simply uses a Software ANT with which we will crack/Reset /Hack any Nokia mobile password. First of all uninstalled Nokia PC Suit or any Nokia Software if you already have in PC/laptop then Connect nokia mobile ,whose Password to be Crack or Hack , via USB and follow below steps. Now after downloading this tool just extract the tool and after extracting the tool you will find simple.exe file, double click on it. Now just connect your device to your PC using USB Connection. If you have Nokia PC suite installed, make sure its closed. Now on the ANT Main Tab choose Normal from the dropdown menu and click on Get option to get your device IMEI Number. Now it will just display your device IMEI Number in the below status bar, so now you need to shift to the Service Tab. 7. Now in the Service Tab you need to on Get once again under the User Code option, so this will just start scanning for your user code and then it will display the code on the right hand side box like in the below image. So that's it now your security code is visible and you can easily enter that to unlock or reset your device, well this tool even provides you all other options like Resetting your device to factory settings, and many other tools to upgrade your device. So possibly this will end up helping in you in difficult times when you are not bale to unlock your device using your forgotten security code. if you like our blog then you can join us on any social Network sites for latest updates. Won't show the code if phone is already locked.